No food need be off-limits when you are following a low calorie diet, and even a dessert is fine now and then. Just make sure your have modest portions. Desserts based on fruit are particularly suitable. Meringue, too, is very light in calories and is very versatile. You can prepare the fruit part of this recipe ahead of time and leave only the meringue to add at a later stage. This delicious dessert recipe has only 90 calories per serving. Clean the rhubarb and cut into 2.5cm pieces. Finely chop the stem ginger, if using. Place the rhubarb in a large saucepan with 25 grams of the sugar, the chopped stem ginger and the orange rind. Cover and cook gently for 2-3 minutes, adding a little orange juice if necessary. Add the raspberries. Spoon the mixture into four 150ml ramekins or ovenproof teacups. Whisk the egg white and remaining sugar together until foamy. Place the bowl over a saucepan of simmering water and continue to whisk for 5 minutes or until stiff and shiny. Place a spoonful of meringue mixture on top of each ramekin and bake at Gas mark 4 (180 degrees C) for 5-10 minutes or until lightly golden. Cooked in only 15 minutes, this low calorie dessert should then be chilled for 10 minutes before serving. It has only 70 calories per serving. Put the peaches in a pan with the orange juice, sugar and cinnamon. Simmer gently for 5 minutes. Remove the peaches with a slotted spoon and put in a bowl. Let the juice bubble until reduced by half. Pour over the peaches, then cool, cover and chill. Remove from the fridge about 2 hours before serving and stir in the halved strawberries. The perfect answer to a chocolate craving, this dessert recipe has only 130 calories per serving. Put the sugar, cocoa powder, coffee and cinnamon stick into a large pan with 600ml water. Bring to the boil, stirring until the sugar has completely dissolved. Boil for 5 minutes, then remove from the heat. Leave to cool. Remove the cinnamon stick, then chill. If you have an ice cream maker, put the mixture into it and churn for about 30 minutes until firm. Otherwise, pour into a freezer-proof container and put in the coldest part of the freezer until firmly frozen. Transfer the frozen mixture to a blender or food processor and blend until smooth. Quickly put the mixture back in the container and return it to the freezer for at least 1 hour. To serve, scoop the sorbet into individual cups and drizzle 1 tsp chocolate liqueur over each portion. Serve immediately. 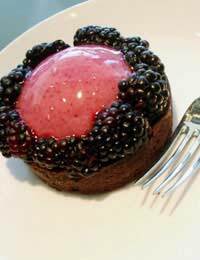 This low calorie, creamy-tasting recipe is high in Vitamin C.
Reserve a few blackberries to decorate and place the remainder with the caster sugar and 2 tbsp water in a saucepan. Bring to the boil over a moderate heat. Lower the heat straight away and simmer gently for 3-4 minutes. Sieve the blackberries and their liquid into a bowl to remove the pips then sprinkle the gelatine over the puree. Whisk with a hand whisk or stir with a spoon until the gelatine has dissolved. Allow to cool. Beat the low calorie ricotta and cream cheeses together in a bowl and stir in the blackberry mixture. Fold in a tablespoon of the whisked egg whites with a metal spoon to loosen the mixture and then fold in the remaining whites until there is no white visible. Spoon into wine glasses or glass dessert dishes and decorate with the reserved blackberries and mint leaves.